For 10 years I have been a fervent daily observer/experiencer of transportation issues in our city. I began while driving my unregistered 250cc motorbike without license and now “drive” a legal car with papers from/to home everyday. What used to take me 15 minutes in full speed, now takes about 45 minutes in “slow” mode. My favourite time was during Tet when HCMC's streets were emptied for a week. It was then the best time of the year to drive around to uncover what could not be observed the rest of the year. Today, these “cool down” phenomena last a day or two and many small street vendors remain open. Not the same really. Back then; we rode dangerously as helmets were optional. That entire free spirit changed abruptly on January 1st 2008, a turning point for us all. I still wonder how did the government managed to implement such important safety legislation within a day! In those days, police rarely stopped “white foreign” faces, too afraid of miscommunications. Since then, lots of English speaking training was conducted and we, “the Expats” are not treated so differently anymore. In 2006, traffic “rules” were mainly applicable for “blindsided ladies” who could not see too well. And yes, police street presence was less significant. Except, of course, for the 30 days leading to Tet where a bonus fine was to be collected by police to continue to “protect” us against the lawless drivers. This behavior is now active year round. Back then traffic congestion was certainly nothing like it is now, as cars were available to the elite mostly. Nevertheless, the main axes were already too crowded with bikes all over, especially at peak hours. So much then, that traffic often took place on the pavement too. These pavement drivers continue to fay their way on unauthorised territory, but more rarely these days. Today, the leading streets are further saturated, regardless of numerous road improvements and the newly built bridges. Apart from the peak hour’s ever present congestion, you may have noticed that driving in the city center between 7 p.m. and 10 p.m. now requires a certain degree of insanity. The rare times that I do visit the city at these odd hours recently felt like a fashion show. 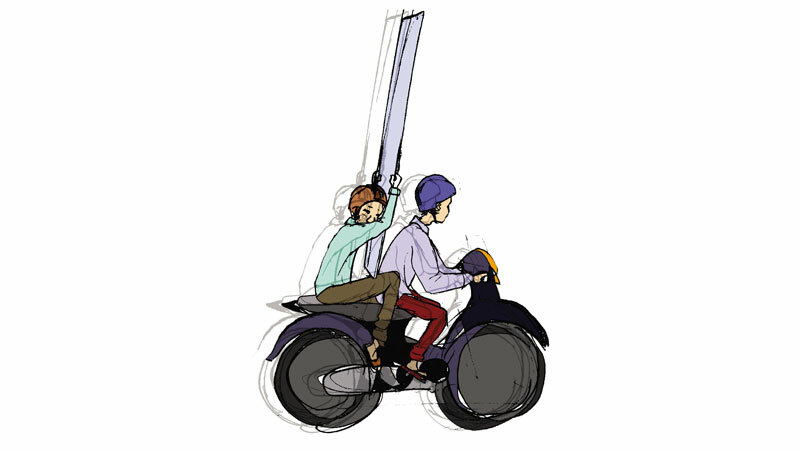 Honda HD, Piaggio and the likes are often driven by well dressed pretty looking boys held tightly by young, lovely long-legged ladies wearing shorts and high heels. Showtime for many; a kind of status empowerment exercise that reminds me of Cannes. In the past, roads were too often flooded; especially during the heavier Monsoon seasons. This resulted in serious street damages across the city. Flat tires occurred more often, but not all could be blamed on the quality of streets. Much was due to planted nails that finance the nearby tire repair shop business activities. Traffic light synchronization is and has always been weak, and much of our daily traffic congestions is the result of that. Other constants include the fact that when a foreigner has an accident, he is always responsible for paying the bill regardless of responsibility. Another steady matter is road signage for directions. It was and remains mostly inappropriate and ineffective, and a special mention is awarded for street address numbers, which most of the time follow no logical order. Some of the above listed issues can be used as a to-do list to effectively begin to improve traffic and transportation in our city, at least for the short term. If not, we may have to suffer hell for an extra 20 years or so until all metro lines as well as other public transportation methods are fully operational. It’s very likely that in your travels around Ho Chi Minh City, you have - at least a few times - been stuck trailing behind a bus spewing thick black smoke in your face. You probably weaved through traffic at this point, attempting to overtake the ecological disaster in front of you. Ho Chi Minh City is not an emissions pollution disaster like some other countries, although it is in the top 10. Recently, transport authorities have released a series of 23 eco-friendly buses that use compressed natural gas (CNG) as fuel, according to Thanh Nien News. A ceremony was held on March 1 to celebrate the occasion by the Saigon Transportation Mechanical Corporation (SAMCO). CNG is methane stored at high pressure. It is used in place of petrol, diesel fuel and propane, and emits less environmentally unhealthy gases than the other three according to Wikipedia. The CNG-fueled buses will run along route 33, which connects university campuses in Thu Duc District and An Suong Terminal in the Hoc Mon District. They will join an existing fleet of environmentally friendly buses, upping the total number to 52 buses. US$2.8 million was spent to acquire these buses. 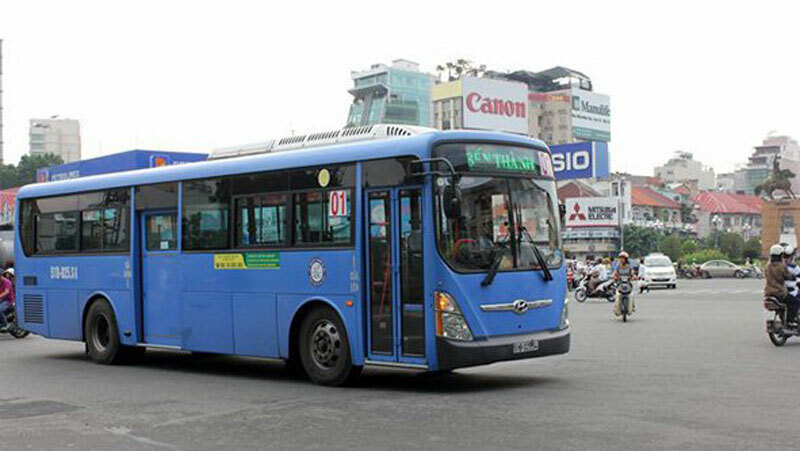 Government authorities have approved a plan to introduce hundreds of eco-friendly buses to Ho Chi Minh City, which will make travel in the city less environmentally damaging. 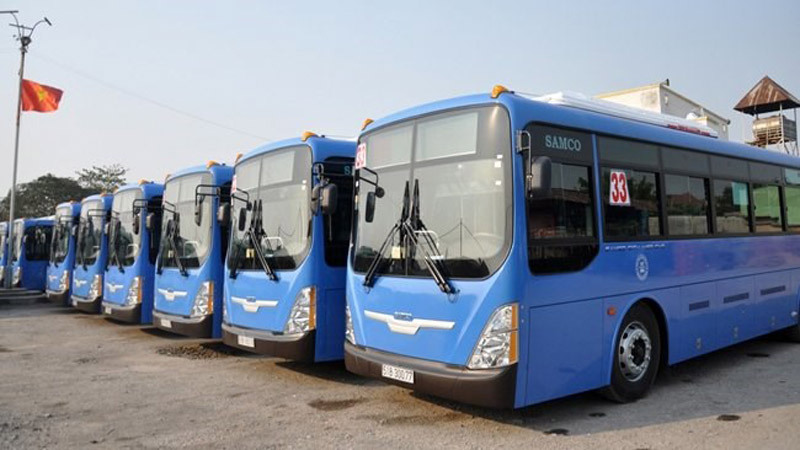 According to ngvjournal.com, general director at SAMCO said that “the buses are SAMCO’s first shipment of a 300-bus purchase by the People’s Committee of Ho Chi Minh City.” According to vietnamnet.vn, this project will extend to 2017. 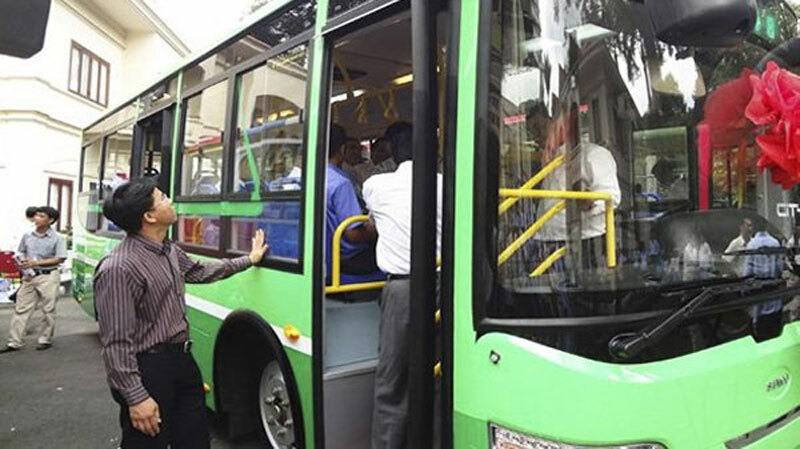 In addition, according to deputy director of the city’s transport department Le Hoang Minh, an invest plan has initiated to replace 1,318 old buses with 1,680 new ones, as reported by Tuoi Tre News. The deputy director also said that the department looks to improve the behavior of bus drivers and bus attendants. 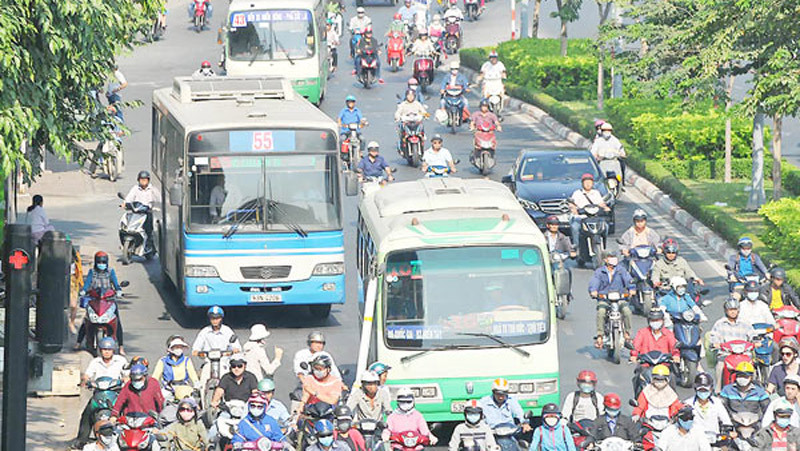 Currently, Ho Chi Minh City has 3,000 operating buses. Given the fact that buses are the city’s only form of public until the metro arrives in town, and that bus passenger percentages have dropped as of late, this will be a welcome addition to Saigon’s transport scene. If you do not hold a driver’s license of any kind, you have to pass both theory and driving tests. The theory test is in Vietnamese and you are not allowed to have an interpreter or translator. Be a Vietnamese residents or a foreigner who is allowed to reside, work or study in Vietnam. A completed application form to register at the driving examination. A photocopy of your permanent residence card or valid passport. Health certificate provided by jurisdictional health department. After taking the examination you will be granted your driver’s license within 10v workings days. You have to reside in Vietnam and have at least a three month Vietnam visa. A photocopy of a valid visa or permanent residence card. Saigon’s Tan Son Nhat Airport has been the bugbear of many travellers over the years—from frequent flooding due to its trash laden drainage system to announcements by foreign airlines that the number of flights to and from the airport would be cut, as in the case of Etihad Airways that now only operates four flights a week instead of the previous seven. Although it’s one of the only cities in the world where its international airport is barely a half-hour ride away from the city centre, the situation at Saigon’s airport has been much talked about mainly due to its overcrowding and frequent flight delays. Originally built for a capacity of 25 million passengers a year, the airport is currently serving 36 million passengers and although announcements were made regarding the brand-new Long Thanh international airport in Dong Nai Province almost two years ago, there haven’t been any feasibility studies conducted and no guarantees that the airport will actually be ready by 2025. In the meantime, Vietnam’s government has tasked the Transport Ministry to execute a proposal set forth by French consulting firm ADPi, a subsidiary of Aeroports de Paris Group. 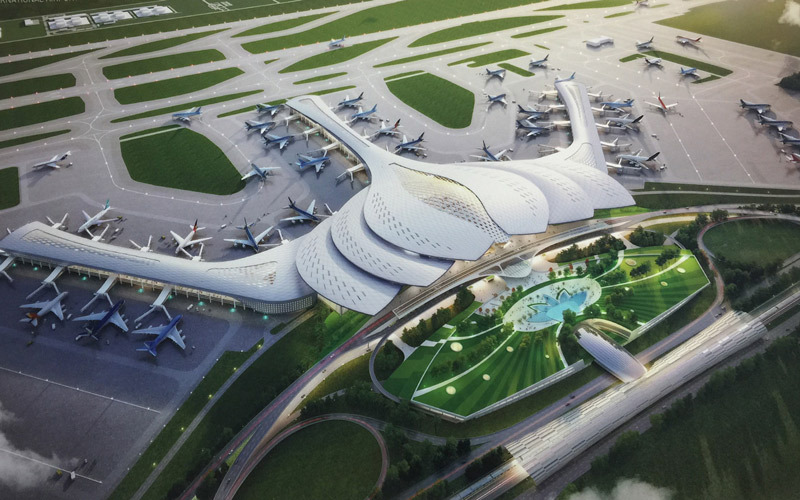 The firm, responsible for the airports in Beijing, Seoul and Dubai, has proposed a plan to expand the present airport by building a new 20-hectare terminal that will be able to serve an additional 20 million passengers a year by the year 2025. This new terminal will be built to the south of the current airport facilities, and the expansion will also include new structures to support a cargo terminal and maintenance facilities to the north of the airport where the much-talked about golf course is currently located. This expansion is expected to cost VND30 trillion (USD1.3 billion), excluding costs that will be required for site clearances. Saigon is expected to receive 60-70 million passengers a year by the year 2025. However, as things currently stand, a little patience will be required from travellers flying in or out of the city. Someone once said if you are irritated by every rub, how will you ever be polished? When you hear a Vietnamese colleague say, once again, “I’ve been unlucky…had an accident yesterday”, as they hobble displaying a bit of agony, almost gone is the sympathy, instead you’re bursting to say: IT’S NOT THAT YOU’RE UNLUCKY! PEOPLE DRIVE LIKE THEY ARE COMPLETELY INSANE AND NO ONE CARES ABOUT ANYONE ON THE ROAD! Uhm… I can assure you that luck has absolutely nothing to do with your misfortunes my dear friend. We must admit that many expats, including myself, have assimilated and do drive like idiots from time to time as well. I’ve been pondering how to convey the insanity of driving in Saigon to people who have never driven here. Driving in Saigon for eight years has truly inspired me to write on such a merging topic exploring social values, economic development and the Vietnamese psyche. The glorious hallucinogenic episodes of daily driving in our lovely city. Why hallucinogenic you may ask? Well because many driving scenarios on these roads are simply unbelievable! As you cruise along one of the many fine intertwining networks of roads in this chaotic urban maze, you see yet another couple with their baby in front heading straight towards you at full speed (opposite direction of course)… eyes locked in unconditional disbelief. Both you and they speculate… what a moron! Unfortunately this is the norm. Anyone who drives in Saigon will be more than familiar with the signal light conundrum… signal left (in any other place people will pass you on the right) and get an onslaught of bikers passing you on the left missing you by millimeters. Don’t try and figure out why, it leads to nowhere. 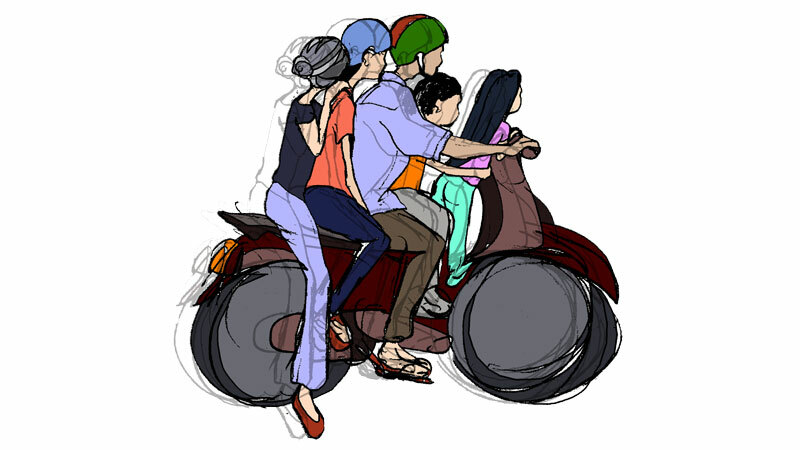 According to Tuoi Tre News (January 2016), on average, road accidents kill around 9,000 people in Vietnam every year – and leave tens of thousands of others with injuries. Vietnam is one of the countries with the highest death rate from road accidents in the world following closely behind India and China. The local driving style claims about 30 lives per day usually from severe head trauma. Hmmm, you may want to consider spending a bit more than VND50,000 on a helmet guys. Shockingly, the months leading to Tet (the proverbial joyous time of year) sees the death rate climb steeply. Some may attribute this to the term “Tet-ness”, the time when people become possessed with images of the new year that carries a free pass to drive invincibly. Many locals lament that Tet just isn’t what it used to be, lacking the emotional happiness with family and loved ones. Often it’s said that within the past 5-10 years the lead up to Tet includes numerous thefts and negative experiences and increased reckless driving. Some say it’s the education that is the problem… sorry but I don’t understand that one guys, I mean in other Asian countries where driving is safer, they don’t teach in schools to not drive the opposite direction into oncoming traffic at full speed, or that it’s not a good idea to wave your baby in the air while driving your scooter, right? It is just common sense. There are a few refreshing examples of people helping to make things better. Some university students have grouped together with long ropes coercing drivers to go only the right direction on the roads, holding signs saying don’t drive the opposite direction on one-way streets (cam di nguoc chieu). A few years back there was an expat in Hanoi, holding the rear of motorbikes when drivers went the opposite direction. Many locals agreed with his actions in hopes of creating a safer place to drive. Obviously lack of proper law enforcement to shape a society that fosters safe driving skills is paramount. Ok guys, solutions… ? How about whispering in your neighbor's ear: ban oi, slow down, relax, you only get one life, cherish it, pass it on. Lawson Dixon is an amiable Australian who started with the News Ltd media company in the 1980s but has spent more time out of Australia than in since. 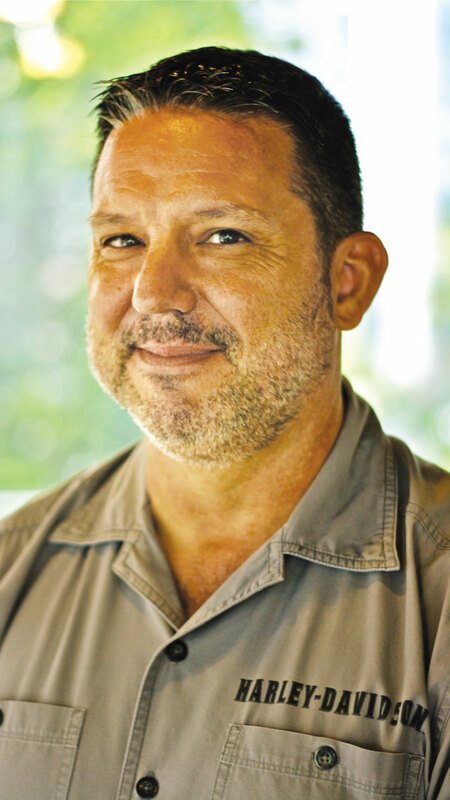 He has a background in automotive advertising and has worked with Ford and Chrysler in the past. He started Ducati in Vietnam before finally getting the Harley-Davidson franchise off the ground in 2013. He beat 70 competitors to win the right to be the first Harley-Davidson dealer in the country. He has matched the hard graft with a golden touch; the very week that they opened for business the ban on big bike licenses was lifted in the country. Prior to this, the only way to get a license to ride a large machine was via a government sponsored motorcycle club. We met up with Lawson in their District 7 showroom, surrounded by some of the most beautiful motorbikes in Vietnam. How long has Harley-Davidson been active in Vietnam and how many outlets are in the country? We opened in November 2013 with very few pre-orders. It was worrying at first as we felt sure there would be much more. It seems that people had got their fingers burned in the grey market and were sceptical, until they saw our operation. We have two showrooms, one here and one in Hanoi. How are sales, in general and in comparison to targets? We initially targeted 10 to 12 units per month but are pleased to report that we are selling 20 to 25 here and about 15 in Hanoi. 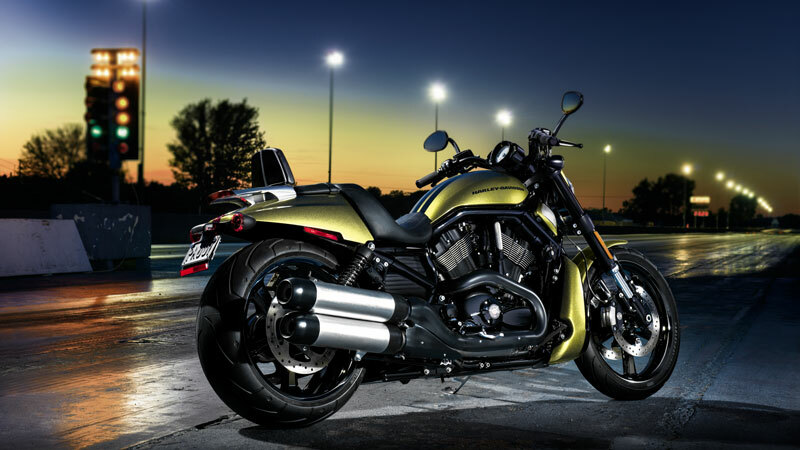 Who is your direct competition and where does Harley-Davidson stand in the market? We really have no direct competitors, but I suppose the closest would be Ducati, Benelli, KTM, Suzuki, Kawasaki and BMW. As for our position, I’m not sure overall but for the over 1200cc market we are certainly number one. Is there a Harley-Davidson owners group? Yes, as an official dealer we have the rights to sponsor Saigon H.O.G. and they are very well respected. When the Cau Giai freeway opened we rode through to officially open it. Eighty members, it was really special. Harley Owners Group is worldwide; the biggest motorbike club in the world with a million members. When someone buys a bike we register them automatically for the first year. They then have the option of joining the local chapter. There are about three or four hundred members in the country. How do your customers report their treatment by police? I have to say all of my personal dealings have been fantastic. I’ve never heard of anyone being poorly treated because of riding a Harley-Davidson. We make sure we drive appropriately. Road safety is taken very seriously by the H.O.G. We actually trained some of the police riders. We were the first people to bring in international riders as trainers. We have taught more than 300 riders to ride safely. We teach low speed handling, how to lift a bike if you drop it. We ride round cones in car parks, learning safe riding skills. We also train on how to ride in a pack. If you have 45 bikes doing 80 kph there are important rules that you have to follow to enjoy the ride and stay safe. It seems unlikely that a Harley motorcycle would get stolen. Am I right in thinking that Harley-Davidson bikes suffer less thefts or damage than other bikes? Yes. All machines have immobilisers and alarms. We have not heard of any thefts. We have heard of stolen bikes being smuggled into the country, but not be taken whilst here. These are big machines, not many people can just jump on a Harley and ride of. What do you see as the opportunity or challenge for expansion of the big bike market? I think the opportunities are huge. Proportionately Vietnam is the biggest market in the world. The key challenge is to reach out to the younger guys. Traditionally we have sold to older, financially secure, mainly men. We have to take the challenge to a younger market and appeal to that market. With that in mind Harley-Davidson have introduced “Dark Custom”. This is a concept where customers can personalise their bikes to their own likings. It’s a lifestyle statement in which we are marketing to people a blank canvas on which they can imprint their own personality. This appeals very much to Vietnamese people, who make up 98% of our customers. So are bikes getting customised here in Vietnam? Absolutely, when you go to a function and see the bikes parked up, every bike looks different, handle bars, exhausts, colours, etc. Harley motorcycle are highly customisable. Vietnamese people love originality and Harley-Davidson does this better than anyone. How do you train your mechanics? I can proudly say that we have the best trained mechanics in Vietnam. They all use Snap-on brand tools and we have the best equipped workshops. We had a guy who came out from the States and spent three months working on intensive training. Before that, we spent time in Singapore. Harley-Davidson University is now in Bangkok, we send technicians there to train extensively. We have eight fully trained mechanics. Saigon traffic is notorious. What happens if an accident happens? What facilities do you have for repairing damage? It doesn’t happen as often as you think, in fact very rarely. In most cases a bike falls off a stand, not put up properly. Occasionally a rider drops a bike, but most of our customers are very experienced riders. If damage occurs we have the facilities to repair it. Up to what age have people bought bikes from you? The oldest guy we have sold to was 77. Before unification he saw a bike and always wanted one... he bought a Dyna Street Bob, 1690cc.